Cream the butter and sugar together until well combined and creamy. Add the eggs, flour, chai mix, buttermilk, baking soda, vinegar and vanilla essence and mix until well combined – be careful to not overmix. Spoon into cupcake cases and bake for 15-20 mins. Let stand to cool. Using a mixer, blend the butter until smooth and creamy. Now add the icing sugar, chai mix and vanilla essence and mix until all the ingredients are well incorporated. 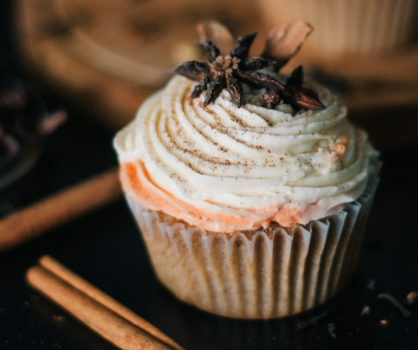 Pipe the icing onto the cupcakes once cooled and decorate with a sprinkle of chai spice and whole spices – I used cinnamon sticks and star anise. Interested in receiving our FREE recipe of the month, latest offers and newsletter? Copyright © 2019 Hans Dairy Inc. All Rights Reserved. Made with by Ankit Designs.